RealNetworks is offering schools a new, free security tool: facial-recognition software. But as the technology moves further into public spaces, it's raising privacy concerns and calls for regulation — even from the technology companies that are inventing the biometric software. Microsoft has acknowledged the bias issues and is taking steps to better identify diverse faces, broadening the database it uses to train its system by adding photos of more diverse people. The company didn’t see any benefit in teaching the machine to recognize race. “It’s loaded,” Vance said of racial identification. SAFR has been watching over the main entrance gate of Seattle’s private elementary University Child Development School (UCDS) since this spring, buzzing in parents who come to pick up or drop off their kids. The school, where RealNetworks CEO Rob Glaser’s kids were enrolled last year, wanted to try out the system to add to overall security at its University District campus. 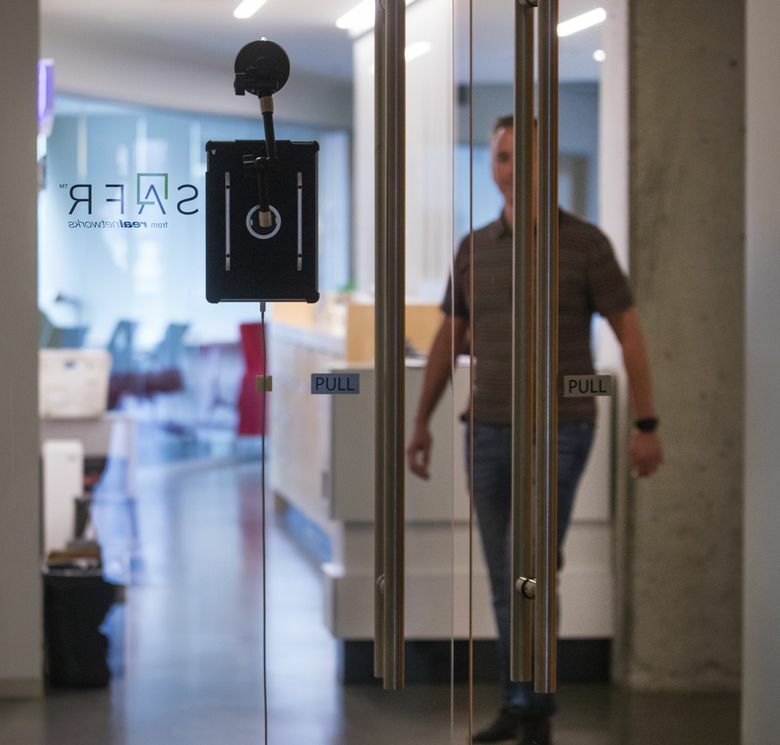 It acts as an automatic doorman for parents and staff members — if a parent’s face is recognized by the camera mounted above the front gate, the door opens, reducing the need for someone inside the school to diligently answer a buzzer. The school sent out information about the system to parents and gave them the option of adding their face to the machine’s database — something that Hedrick and about 300 parents and caregivers have done. The SAFR system at the school will identify only adults and rejects the addition of children to the group of identifiable faces (which a few kids have tried to do, unsuccessfully, using the system’s self-add feature). RealNetworks plans to keep giving SAFR to schools for free, even as the company expands it to new industries where it will charge for the system, Vance said. The rash of school shootings across the country has thrust school security into the spotlight. 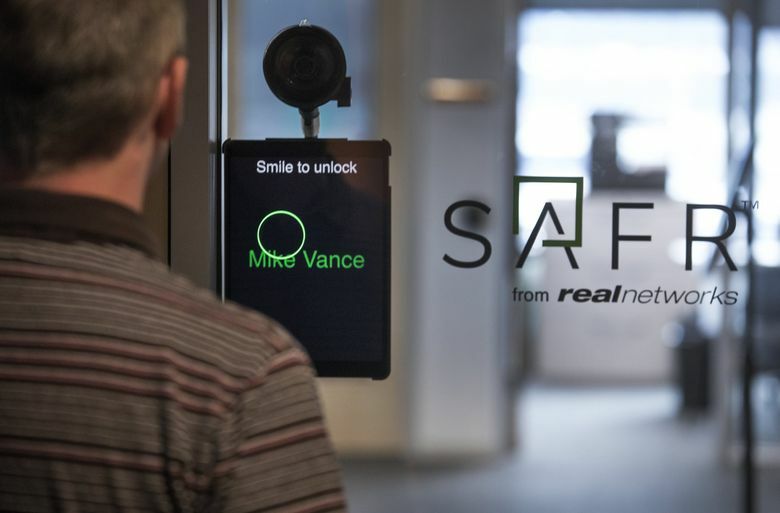 RealNetworks executives said they know SAFR isn’t a fail-safe system, but they figure each little security component helps, especially one that can recognize if a known, unwanted person has attempted to enter school grounds. Some critics, however, aren’t so sure such systems in schools will be effective enough to outweigh the privacy costs. Privacy issues have become an increasingly common topic as facial recognition gets more accurate. Big tech companies, including Amazon and Google, faced opposition for selling their systems to law-enforcement agencies, which some fear could lead to a police state and unfair profiling. But law-enforcement agencies have also used such systems to find missing people and arrest criminals, something that helps public safety. Some critics believe tech companies should restrict the use of the technology. But its development and its use by law enforcement agencies has reached the point where the federal government should step in and regulate it, Microsoft President Brad Smith argued in a blog post this summer. RealNetworks is supporting its Redmond neighbor’s call for regulation, Vance said. Regulations are already in place in Europe, where a recent sweeping privacy law calls for organizations to inform people before collecting their biometric data and tell them what it will be used for, even in stores and businesses. A few U.S. states also have consent laws regarding the technology. A Washington law passed last year requires companies, before collecting biometric data, to inform people and tell them what their information will be used for. But most states have no mandates and the federal government has yet to address the topic. In China, the technology is so common that it can identify people who are jaywalking and display their photos on public digital billboards. The U.S. isn’t near that level yet of routinely identifying people in public streets or parks, said Clare Garvie, an associate at the Center on Privacy and Technology at Georgetown Law Center, but she finds the lack of transparency into how the technology is being used and the lack of federal laws troubling. Garvie was on a team that conducted a widespread study that found 54 percent of U.S. residents are in a facial-recognition database accessible by law enforcement — usually in the form of a driver’s license photo. “It is unprecedented to have a biometric database that is composed primarily of law-abiding citizens,” Garvie said. But proper regulation could prevent that, and there’s reason to be optimistic, Garvie said, pointing to Microsoft’s call for such laws. Use of the technology has been slowed to some extent because it’s still limited in some ways: It isn’t as accurate identifying faces in different lights or in motion, and it takes a tremendous amount of computing power to quickly match faces among billions of photos. But these hurdles are surmountable, said Alessandro Acquisti, a professor of information technology and public policy at Carnegie Mellon University. He pointed out that facial recognition can be used for good — to combat child trafficking — and for bad — to track law-abiding citizens anywhere they go. That doesn’t mean it’s neutral, he said. Anonymity is becoming more scare with the proliferation of photos on social media and the technology that can recognize faces. “Those with unfettered access to your data, and especially those whose usage of your own data you cannot inquire about or limit, have power over you,” he said.